The Moho: Image of Earth's internal structure by USGS - Mohorovicic Discontinuity (red line) added by Geology.com. What is the Mohorovičić Discontinuity? The Mohorovicic Discontinuity, or "Moho," is the boundary between the crust and the mantle. The red line in the diagram shows its location. In geology the word "discontinuity" is used for a surface at which seismic waves change velocity. One of these surfaces exists at an average depth of 8 kilometers beneath the ocean basin and at an average depth of about 32 kilometers beneath the continents. At this discontinuity, seismic waves accelerate. This surface is known as the Mohorovicic Discontinuity or often simply referred to as the "Moho." How Was the Moho Discovered? The Mohorovicic Discontinuity was discovered in 1909 by Andrija Mohorovicic, a Croatian seismologist. Mohorovicic realized that the velocity of a seismic wave is related to the density of the material that it is moving through. He interpreted the acceleration of seismic waves observed within Earth's outer shell as a compositional change within the Earth. The acceleration must be caused by a higher density material being present at depth. The lower density material immediately beneath the surface is now commonly referred to as "Earth's crust." The higher density material below the crust became known as "Earth's mantle." Through careful density calculations, Mohorovicic determined that the basaltic oceanic crust and the granitic continental crust are underlain by a material which has a density similar to an olivine-rich rock such as peridotite. 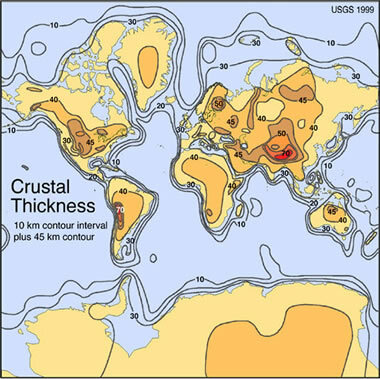 Crustal thickness map: Thickness of Earth's crust by USGS - since the Moho is at the base of the crust, this map also shows depth to Moho. How Deep is the Moho? The Mohorovicic Discontinuity marks the lower limit of Earth's crust. As stated above, it occurs at an average depth of about 8 kilometers beneath the ocean basins and 32 kilometers beneath continental surfaces. Mohorovicic was able to use his discovery to study thickness variations of the crust. He discovered that the oceanic crust has a relatively uniform thickness, while continental crust is thickest under mountain ranges and thinner under plains. The map on this page illustrates the thickness of Earth's crust. Note how the thickest areas (red and dark brown) are beneath some of Earth's important mountain ranges such as the Andes (west side of South America), Rockies (western North America), Himalayas (north of India in south-central Asia), and Urals (north-south trending between Europe and Asia). 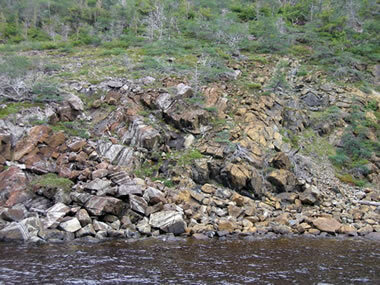 Mantle rock at surface: Ordovician ophiolite in Gros Morne National Park, Newfoundland, Canada. Ancient mantle rock exposed at the surface. (GNU Free Documentation License Image). Has Anyone Ever Seen the Moho? No one has ever been deep enough into the Earth to see the Moho, and no wells have ever been drilled deep enough to penetrate it. Drilling wells to that depth is very expensive and very difficult because of the extreme temperature and pressure conditions. The deepest well that has been drilled to date was located on the Kola Peninsula of the Soviet Union. It was drilled to a depth of about 12 kilometers. Drilling to the Moho through oceanic crust has also been unsuccessful. There are a few rare locations where mantle material has been brought to the surface by tectonic forces. At these locations, rock that used to be at the crust / mantle boundary is present. A photo of rock from one of these locations is shown on this page.